A race ready glove, the Shot Race Gear Contact Raceway glove combines race winning technology into a glove that is comfortable. Using nylon super mesh and liteprene construction, this motocross glove gives you the freedom while protecting your hand. Built in silicone finger tips give you better grip of hand controls. 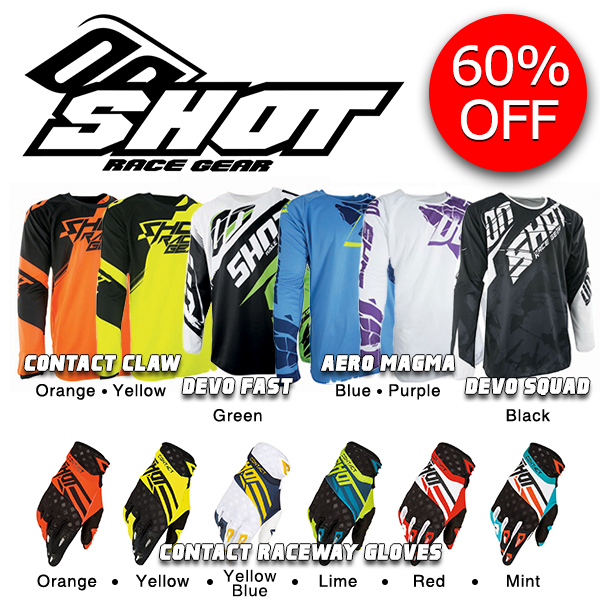 The Shot Race Gear Devo Capture Jersey is a top quality racing motocross jersey at an affordable price. Designed for true motocross and off-road riding, the 2016 Devo Capture jersey uses durable materials to provide a fit that is unmatched from the competition. Utilizing the best materials that offer superior ventilation, the Devo Capture jersey uses micromesh polyester material that won't irritate the rider and allows for max ventilation. An excellent choice for beginners or pros, the short cuff design keeps arm pump to a minimum and the raglan cut sleeves ensure total all day comfort. Paired with the matching motocross pant and gloves, the Shot Race Gear Devo Capture jersey is this year's stylish choice when it comes to motocross gear.